I have been running FreeNAS on an HP G7 N54L ProLiant MicroServer for a few years, including running an Ubuntu Server VM in VirtualBox running in a FreeBSD jail. However, VirtualBox support in FreeNAS had been deprecated, and as of FreeNAS 9.10.2 it is broken and won't be fixed. FreeNAS 9.10, however, includes support for an alternative in the form of bhyve. In FreeNAS 9.10, it can only be managed using the command line, for which a tool called iohyve is provided. Warning FreeNAS 10 is due for release in late February and there currently isn't a migration path planned for iohyve VMs. In fact, iohyve support on 9.10 is said to be experimental (although I would say that is far from made clear in the documentation). It's not clear at this stage what exactly will happen to the VMs on upgrade to FreeNAS 10 (once released), but I would hope a similar process to this could be used to migrate VMs. As I found my VM broken after updating to FreeNAS 9.10.2, I set about trying to migrate the VM to bhyve using iohyve. Putting together various bits of information I found online, I was able to successfully migrate the VM, and here's how I did it. Make sure your hardware has the virtualisation technology needed. See this section of the FreeNAS documentation for how to check. Be aware that iohyve does not have the same feature set as VirtualBox (in particular no graphical console at present), and so may not be suitable for your purposes. This guide only applies to FreeNAS 9.10.x. I wouldn't expect it to work on other versions. If iohyve is older than 0.7.7, update FreeNAS to the latest 9.10.x version. 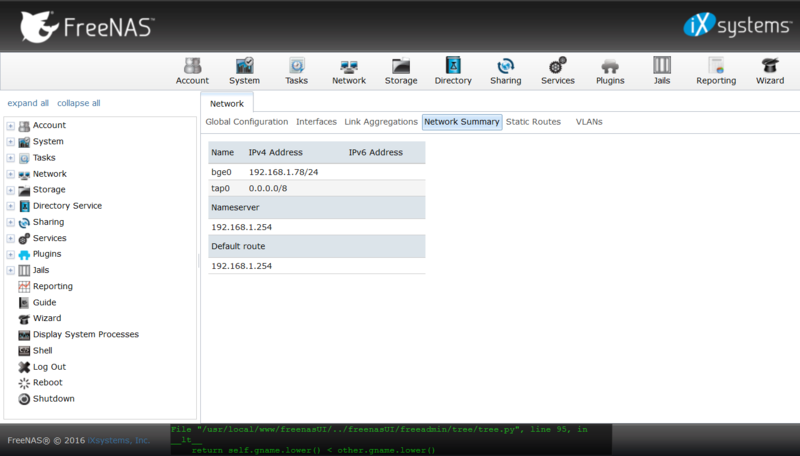 FreeNAS 9.10.2 was the first version with iohyve 0.7.7. If you don't know the name of your ZFS pool, you can also find that out from the FreeNAS web interface, in the Storage section on the Volumes tab. The top-level items are the ZFS pools (but referred to as volumes in the GUI). You can use zpool list in your SSH session to obtain a list of pools and their names if you prefer. Symbolic link to /iohyve from /mnt/iohyve successfully created. Next, we need to convert the VirtualBox disk image to raw format. To do this, I used the VBoxManage utility in the VirtualBox jail. Note If you are using a VirtualBox installation elsewhere to convert the disk, the command has been changed to from VBoxManage clonehd to VBoxManage clonemedium disk in newer versions. Refer to the iohyve README for more details of the parameters. You'll also find examples for different OSes there (however, the only place I found a full list of available OSes was in the iohyve source code). For Ubuntu, being Debian-based, the choices for os are debian and d8lvm. This particular VM was using LVM partitions, so d8lvm was the right one for me. If you aren't sure whether your VM is using LVM partitions, you can find out from within the VM either using fdisk -l or checking /etc/fstab. It is likely to be harmless (depending on the content). At this point, I could press a key and see the Ubuntu login prompt. (Since the VM had successfully started up, I was also able to SSH to it.) If you see GRUB or similar in the console it is something may have gone wrong at some point (e.g. wrong OS type configured). Update 17 January 2017 After upgrading to FreeNAS 9.10.2 U1, I found my tunable entries had been lost and so I had to recreate them. You may need to remove any previously installed VirtualBox additions in the VM. If installed, there should be an uninstall script at /opt/VBoxGuestAdditions-X.X.X/uninstall.sh (where X.X.X is the version of the VirtualBox additions installed). For more information, see the VirtualBox manual. Once you're happy with how the new VM is working, you can delete the old VirtualBox jail (and the raw disk image we created earlier) if you no longer have a use for them. My VM was up and running again at this point. So far I've been happy with it (certainly happier than I was with VirtualBox on FreeNAS). I found the following resources useful when converting my VM and documenting the steps I took above. You may find them useful if you have further questions.